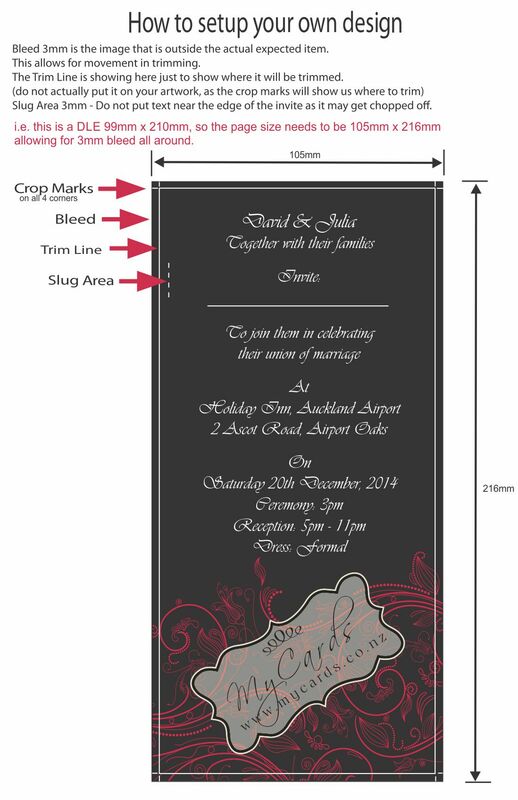 Then we are able to print your invitations for you. You will find that domestic printers are only capable of printing on up to 200gsm. Your Artwork needs to be supplied to us in a format that we can print from. And in a size that is correct for printing. You may have had a “graphic designer” already design your artwork and you are now ready to have it printed. Or you may have decided to design it yourself. See below under FILE SETUP to make sure it meets our specifications. PROOF (1 day turnaround) – You will receive a FREE PROOF (upon accepting our pricing), you can come in and pick this up, or we can freight to you for $5. PRINTING (2 working days turnaround) – We will require a deposit prior to printing, with balance required on pick up or prior to freighting to you. To see our different Card Stocks please go to Card/Stock. For our Terms and Conditions please click this link. It can be any artwork that you have prepared for your Wedding Invitations / Greeting Cards / Birthday Cards / Anniversary / Save the Date / Funeral Cards / Thank You Cards / Posters / Seating Plans and anything else you need printed. * There are exceptions – Placecards / Tablecards / Over A3 / Fans / Envelopes / Die-cutting will all be charged at Website Rates. Correct file setup is extremely important. It may delay your job if you setup your file incorrectly or print incorrect colours, or print pixelated due to too low resolution pictures. Our preferred file type is PDF. Resolution should be 300dpi at 100% (100dpi will print pixelated, whereas 600dpi will take along time to process). Fonts should be converted to curves, or please provide PC fonts required. via Dropbox if over 12mb. Adobe Acrobat is the best program to create PDF’s. (Most people have Acrobat Reader which does not create PDF’s). There are other PDF programs that can create PDF’s, i.e. CutePDF (free) but please be aware that they do not always create a perfect PDF.